Catallia’s S.M.A.R.T. 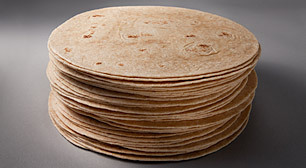 tortilla offers 100% whole wheat, whole grain and provides a 2 oz. equivalent serving to fit even more school menu applications! Master Case Net Weight 17.70 lb. Master Case Gross Weight 18.70 lb. Whole Wheat Flour, Water, Vegetable Shortening (Interesterified Soybean Oil, Fully Hydrogenated Soybean Oil), Contains 2% or less of the Following: Sugar, Salt, Baking Powder (Sodium Bicarbonate, Corn Starch, Sodium Aluminum Sulfate, Calcium Sulfate, Monocalcium Phosphate), Vital Wheat Gluten, Monoglycerides, Preservative (Potassium Sorbate, Calcium Propionate and/or Sodium Propionate), Fumaric Acid, Dough Conditioner (Sodium Metabisulfite, Corn Starch, Microcrystalline Cellulose, Dicalcium Phosphate).Contains Wheat.